In the past several months I ripped all of my CDs to disk. Along the way, I reviewed a piece of high fidelity software. I also got to hear the improvement of iTunes’ latest EQ. Plus I fell in love with a pair of Sennheiser cans. Years ago at Macworld, I met up with Global Delight at their initial launch. I secured a copy of Boom, touted to make your on-board laptop speakers sound better, took it back to my hotel room that night and reviewed the software for publication the next day. I was very impressed. Now several years later, Global Delight has upgraded Boom to version 2. Let’s give another piece of audio software a bash, eh? Boom 2 is built to support 64-bit processors and is tailored for Yosemite 10.10. The GUI sports the new Yosemite look and is very intuitive to use. 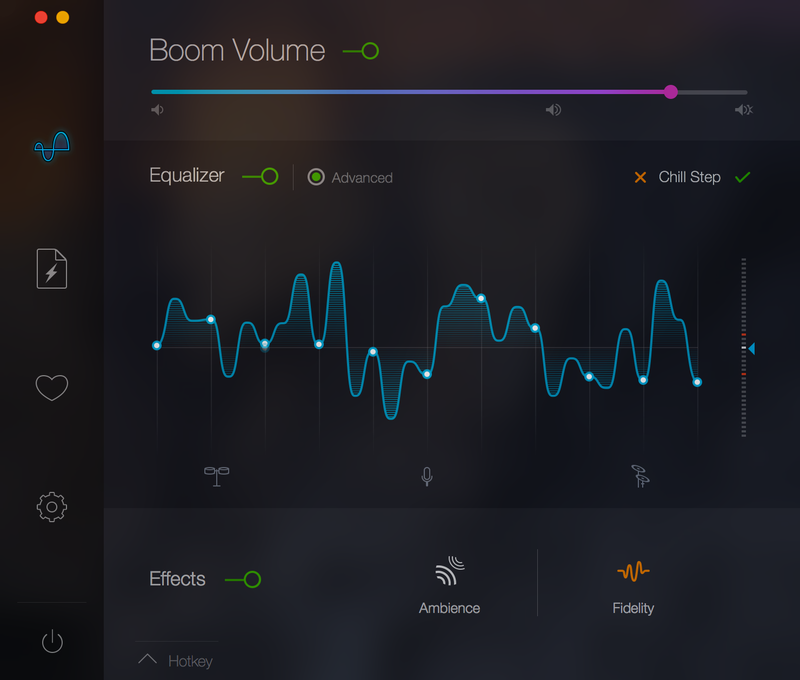 Upon initial launch, Boom 2 calibrates your Mac and sets up the equalizer for what it determines to be the best setting for optimum audio performance of your machine’s hardware. While in use, it analyses every file before recommending an optimal level to boost it to. You can listen to Spotify, iTunes, Netflix, YouTube and any other site/service with much more accurate reproduction. Not only does Boom 2 bring out the audio’s nuances but it increases the volume, as well. You are presented with your choice between a basic 10-band and advanced equalizers, featuring the usual suspects such as presets like Bass Boost, Acoustic, Pop, Treble etc. allowing enthusiasts to change any band or use the frequency constrain feature to tweak your audio. There are two additional audio effects that you can use to alter the quality of sound coming out of your Mac. Ambience, allowing you to tailor a studio performance to sound like a performance at any avenue (like a small club or arena). And Fidelity, providing crisper and sharper tones for a fuller, richer sounding experience. There is also a feature that you might easily miss. 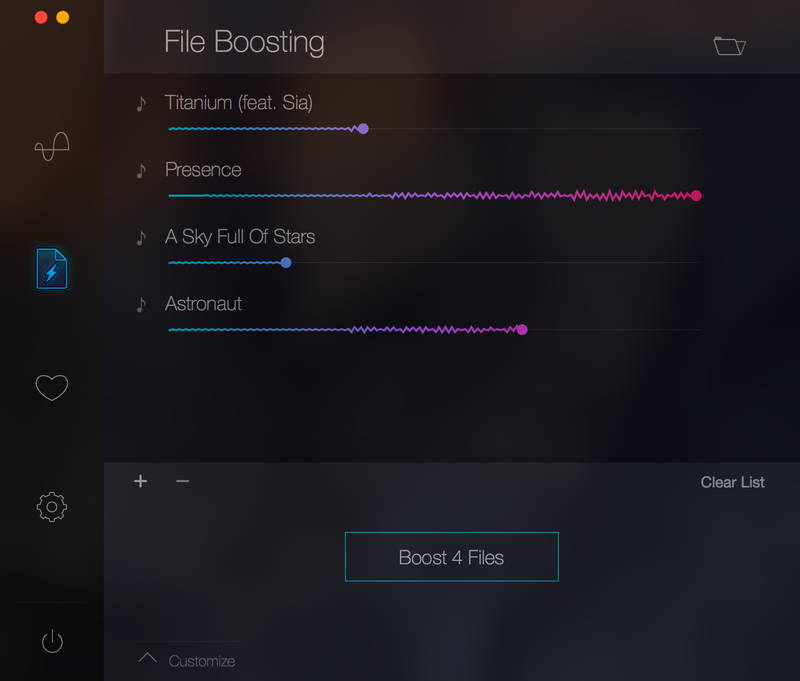 You can drag specific audio and/or video files into a window, where Boom 2 will permanently ‘Boost’ these files and save the boosted copy to it’s own folder. The original file will be left unchanged in your iTunes’ folder. I found that Boom 2 did a solid job with my external speakers. I was particularly impressed with the Fidelity function. I did have to play with the EQ a bit as the boost in volume (and bass) caused my speakers to pop. But this required merely a simple and quick adjustment. I wasn’t disappointed in its performance with my MacBook Air’s speakers. I noticed a distinct improvement in clarity and separation. Boom 2 definitely improves on the initial release’s performance. Also, I think that a minor UI tweak is in order. When you set Yosemite’s MenuBar to dark, unless you know it’s there, you won’t notice the button to launch the EQ/control window at the bottom of the pulldown right away. The three dots to help you locate the button to launch the window remain black and blend in with the pull down menu’s background, making them virtually impossible to see. It would be more intuitive, I think, if the dots where white when in dark mode. Like I said, a minor thing but I thought that I would point it out all the same. I’ve recently reviewed several sound control apps from standard to audiophile to iTunes’ built-in EQ capabilities. For my external speakers, I would definitely say that Boom 2 is a no brainer. For my on-board speakers, the app was quite good but not as impressive as how much it boosted the performance of my satellite speakers. So, if you keep your laptop anchored to your desk, I feel that Boom 2 is worth it. If you’re carting your laptop around and hope to improve your sound when you’re working or creating out and about, Boom 2 is worthy but I would personally would compare playing with iTunes’ EQ and check out some other sound apps before making a final decision. Download their trial and see what you think (or hear). This entry was posted on Tuesday, January 20th, 2015 at 12:45 am	and tagged with Boom, Frank Petrie, Mac software, reviews, software, update, Utilities, video software, YMP, YMPNow, Yosemite and posted in Reviews. You can follow any responses to this entry through the RSS 2.0 feed.